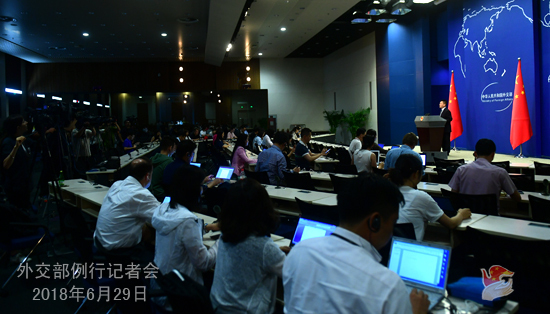 Q: Recently US National Trade Council Director Peter Navarro issued a report entitled "How China's Economic Aggression Threatens the Technologies and Intellectual Property of the United States and the World", slamming China's economic policies. What's your comment? A: The Spokesperson of the Ministry of Commerce already responded to the relevant question yesterday. I would like to reiterate that this report released by the US is obviously trying to seek a pretext for its unilateralist and protectionist practices, even by distorting facts and confusing the public. Such unilateralist and protectionist behavior has disrupted the normal international trading order, undermined the free trading system and multilateral trading rules and violated the law of the market. It runs contrary to the trend of development in the world nowadays. It does not serve the interests of the two countries and beyond. What was recently said and done by the US in terms of economy and trade has aroused extensive concerns in the international community. On China's part, its reform and opening up over the past four decades has provided huge market and institutional conditions for Chinese enterprises and all foreign companies in China, through continuous development of the market economy, strengthened international property rights protection and enhanced governance and rule of law. This is evidenced by the fact that China has become one of the destinations that attract the most foreign direct investment globally over the years. Following its set pace of reform and opening up, China will continue to support and participate in the economic globalization and investors around the globe are welcome to invest in China and share the outcomes of China's economic growth. Q: On June 29, State Councilor and Foreign Minister Wang Yi had a phone call with US Secretary of Sate Mike Pompeo at request. According to what was released by the US, the two sides reaffirmed their commitment to the goal of denuclearization on the Korean Peninsula, and Mr. Pempeo talked about the implementation of the DPRK-related Security Council resolutions. What's your comment? A: The Chinese side has already issued the readout of the telephone conversation between State Councilor and Foreign Minister Wang Yi and US Secretary of State Mike Pompeo this morning. During the telephone conversation with US Secretary of State Mike Pompeo, State Councilor and Foreign Minister Wang Yi stated China's principled position on the Korean Peninsula issue. We hope the US and the DPRK will follow through on the outcomes of the summit in Singapore, meet each other halfway with active interaction, and explore effective means to address each other's concerns with a package solution, so that the political settlement of the Peninsula issue will become a sustainable process. With regard to the implementation of the relevant United Nations Security Council resolutions, China's position is clear-cut and consistent. That has been reiterated many times at this podium. Q: On Wednesday, the conference of the states parties approved the British-led proposal to strengthen the mandate for the Organization for the Prohibition of Chemical Weapons (OPCW) with the aim of identifying those behind the chemical arms attack in Syria. Russia's Deputy Foreign Minister said that Moscow does not recognize the proposal that empowered the OPCW to identify the perpetrators of chemical attacks. Russia's position was supported by China, India and South Africa. I wonder if you have any comment on that? A: At the OPCW Special Conference of the States Parties recently, relevant countries have rammed through the draft resolution on addressing the threat from chemical weapons use in disregard of the tradition of consensus and existing substantial differences. China is regretful for that. We believe such act will inevitably incite political confrontations between states parties and aggravate internal disputes in the organization, which neither helps to uphold the authority of the Chemical Weapons Convention nor truly resolve the issue of accountability in chemical weapons use. We hope that parties will, in the spirit of mutual respect and seeking common ground while shelving differences, move towards the same direction to resolve differences, join hands to address the threat from chemical weapons use and faithfully safeguard the sanctity and effectiveness of the Convention. 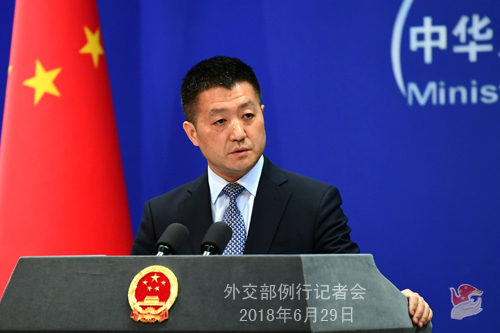 Q: According to reports, the US Department of State issued the 2018 Trafficking in Persons Report on June 28, criticizing China and other countries. What's your comment? A: The US keeps issuing this so-called report one year after another, making irresponsible remarks and groundless accusations of others' counter-human trafficking efforts. China as always believes such act is by no means constructive and firmly opposes it. The Chinese government has taken firm and strong measures to fight the crime of human trafficking, and the outcomes are there for all to see. In the meantime, human trafficking stands as a shared problem for all countries around the globe and no country is immune from it. Countries should step up cooperation to jointly crack down on the crime of human trafficking rather than point fingers at others. Q: According to reports, the US officials revealed that the Department of State has applied to dispatch the Marine Corps to defend the new building of the American Institute in Taiwan (AIT). If the application was approved, it would be the first time for the Marine Corps to be sent to Taiwan for relevant missions. Because the Marine Corps are usually dispatched to the countries that have established diplomatic ties with the US, this has aroused attention from various parties. Are you aware of the relevant situation? What is your comment? A: We have responded to relevant questions. The one-China principle is the political foundation for China-US relations. The US should honor its commitment to the one-China principle and refrain from any official ties or military exchanges with Taiwan. The US side is quite clear about China's position in this regard and knows that it should speak and act cautiously when it comes to this matter lest it should impact the overall picture of China-US ties. Q: We have noted that Union Minister for the State Counsellor's Office U Kyaw Tint Swe of Myanmar and Foreign Minister Abul Hassan Mahmood Ali of Bangladesh are now on their visits to Beijing. The repatriation of people who fled from the Rakhine State to Bangladesh has aroused wide attention. According to our information, there are still some differences between Myanmar and Bangladesh. China has been playing a positive role in promoting the settlement of the relevant issue. State Councilor and Foreign Minister Wang Yi has proposed a three-phased solution. Have the three parties engaged in discussions on properly resolving the issue of the Rakhine State this time? A: I do have some updates to share with you. As to Minister U Kyaw Tint Swe and Foreign Minister Ali's visits to China, we have issued the readouts respectively. With regard to the issue of the Rakhine State you mentioned, China's position is consistent. We always believe that the relevant issue should be resolved through the dialogue and negotiation between Myanmar and Bangladesh, and the international community can play a constructive role in light of the will of the two countries. China is the neighbor of both Myanmar and Bangladesh. While maintaining bilateral communications between themselves, Myanmar and Bangladesh also hope to get the assistance and support from the Chinese side. As a Chinese saying goes, neighbors wish each other well, just as loved ones do to each other. If our two neighbors need us, we can by no means be an on-looker. At noon, State Councilor and Foreign Minister Wang Yi had a tea break with the two visiting ministers, during which they exchanged views on properly resolving the issue of the Rakhine State. I can tell you that the atmosphere was candid, sincere, light and friendly. We have reached four-point principled common understandings. Firstly, the three-phased proposal of "cessation of violence, repatriation and development" should continue to be implemented to improve the situation in the Rakhine State as soon as possible. Myanmar and Bangladesh should conduct negotiation on this basis to seek a proper solution. This serves the fundamental interests of the two countries and is conducive to upholding regional peace and stability. Secondly, addressing the issue of the repatriation of people who fled to Bangladesh remains a pressing task at this point. To this end, concrete measures should be adopted and substantive steps should be taken to repatriate the first batch of people. Thirdly, China is willing to provide further assistance to improve the living and sheltering conditions of the people fleeing the conflicts, including offering emergency supplies and building relevant facilities in accordance with the will of Myanmar and Bangladesh. Fourthly, comparative strengths should be brought into full play to enhance development and cooperation in the border areas between Myanmar and Bangladesh so as to earnestly improve the livelihood there. Q: According to Indian media, Pakistan has been added to the Financial Action Task Force (FATF)'s grey list of countries that finance terrorism at the FATF conference in Paris. Pakistan is China's good friend and China has been supporting Pakistan on the front of counter-terrorism, saying it has been doing a lot. What is your comment on that? A: Pakistan's counter-terrorism efforts have gained the recognition and support from not only China but also many other members of the international community. We always believe that the Pakistani government and people have made enormous efforts and sacrifices for the counter-terrorism cause, which is there for all to see. The international community should give full recognition and trust in that. In recent years, Pakistan has taken vigorous steps to strengthen financial regulation and supervision and fight terrorist financing, which has made important headway. 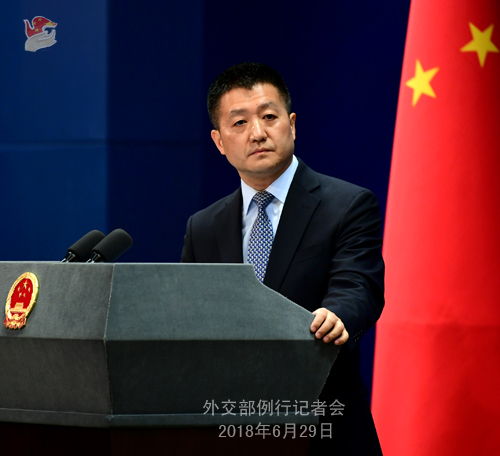 China hopes that all parties can view Pakistan's counter-terrorism efforts in an objective and impartial way instead of criticizing or pressurizing Pakistan lopsidedly. China and Pakistan are all-weather strategic cooperative partners. We are willing to continue to step up counter-terrorism cooperation with Pakistan. Follow-up: Pakistan has given a 26-point program to better its record in combating terrorism. So will China pressurize Pakistan to step up its combat against terrorism? A: We will not comment specifically on how the discussion within the Financial Action Task Force went. I would like to reiterate that Pakistan has made enormous efforts and sacrifices for the counter-terrorism cause against all odds. The international community should view Pakistan's counter-terrorism efforts in an objective and impartial way and give Pakistan more recognition and support so as to promote the international counter-terrorism cooperation in a more effective way. Q: The US Embassy in China on June 28 released a statement, saying that China has rebuffed the US' request to discuss the demand that American airlines should change the listing of "Taiwan" into "Taiwan, China". What's your comment? A: There is only one China in the world and Taiwan is part of China. This is an objective fact and common sense, something universally recognized by the international community. The relevant notice issued by the Civil Aviation Administration of China demonstrates the Chinese government's consistent and firm position on the issue of the one China principle, and the relevant demand is completely legitimate and lawful. Foreign enterprises are welcome to invest and operate in China. In the meantime, they should respect China's sovereignty and territorial integrity, abide by Chinese laws and respect the national feelings of the Chinese people. I shall stress again that the one China principle is the political foundation for China-US relations, something not negotiable. The US government should have urged the relevant enterprises to observe the one China principle and rectify the relevant websites as soon as possible. Q: First, according to what was said by the US government, US Secretary of State Mike Pompeo mentioned the DPRK's smuggling of crude oil on the sea in his phone call with State Councilor and Foreign Minister Wang Yi. What measures have been taken by China concerning this issue? Second, China and Russia put forward a draft presidential press statement at the Security Council on easing sanctions on the DPRK in light of the situation. What is China's stance on that? A: As to your first question, China has always maintained that all the DPRK-related Security Council resolutions should be implemented in a comprehensive, accurate and complete manner. This is also what we have been doing all along as a permanent member of the Security Council, something we believe all member states of the United Nations should do. For any violation or suspicious violation of Security Council resolutions as mentioned by certain reports or rumors on various occasions at different time, the government of all countries should investigate and handle that in accordance with the law on the basis of solid evidence. With regard to your second question, the relevant resolutions of the Security Council stipulate that we shall adjust sanction measures as may be needed in light of the DPRK's compliance, including suspending or lifting relevant sanction measures. China always believes that sanction itself is not the end, and the Security Council's actions should support and conform to the diplomatic dialogue and the endeavour for the denuclearization of the Peninsula at this point, and promote the political settlement of the Peninsula issue.